We’re back in the 1980s for this Spectra slot review. Thunderkick draw on the themes of early computing and classic casino gambling to create a game that’s thematically unique but otherwise a bit too much of the same old, same old. 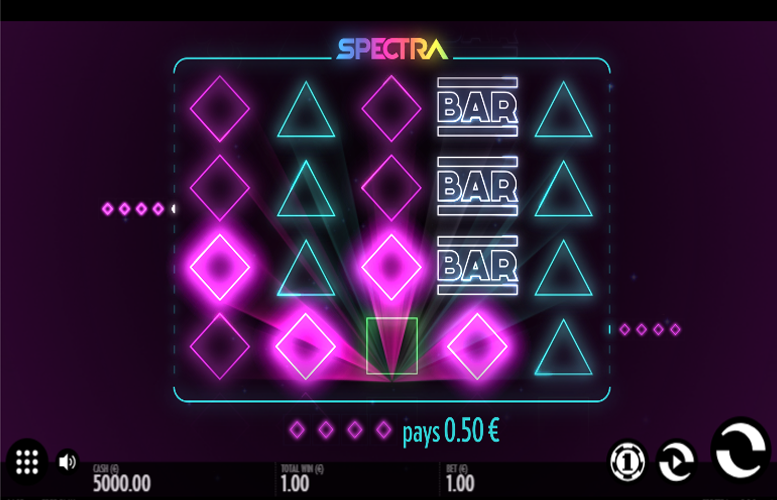 In terms of game specifics, Spectra is played across a grid comprising of five rows and four reels. 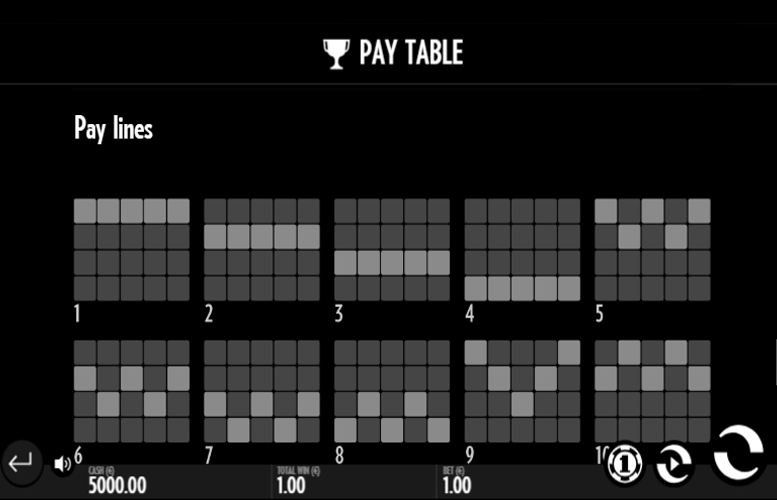 Players must match combinations of the same symbol along the 30 win lines. Unfortunately, there really isn’t much to be excited about on this title. Thunderkick seem to have forgotten to load the game up with special features. Stick with us though, Spectra could still be a winner for you! Interesting merge of themes. As fans of classic video games, this slot immediately caught our eye. Although not particularly ambitious in the looks department, Spectra’s visuals do suit the slot’s theme perfectly. Incredibly unimaginative bonus features. It’s basically just a few “wild” symbol variations. Nothing we haven’t seen before and nothing overly exciting. Lacking any depth to the side games. We have no second screen games, no free spins, and ultimately nothing to get enthusiastic about. Low main game prizes. Normally when we have such minute five-of-a-kind jackpots there are a load of great special features on a game. This is unfortunately not the case on Spectra. The top jackpots on the Spectra slot machine are all awarded for matching five-of-a-kind of the same higher value symbol down a single win line. The illustrations for the symbols representing these top prizes have been inspired by classic slot machines but have been given an early computer game kind of feel. “Wild” = 20x the total bet. 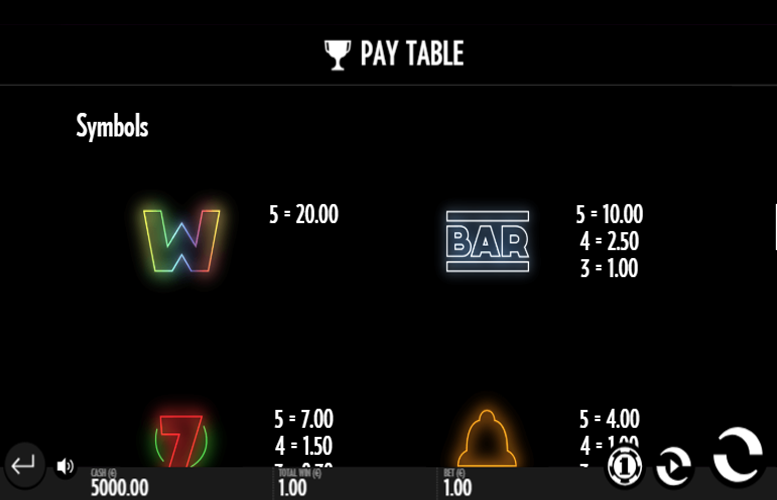 “BAR” = 10x the total bet. Lucky Seven = 7x the total bet. Liberty Bell = 4x the total bet. 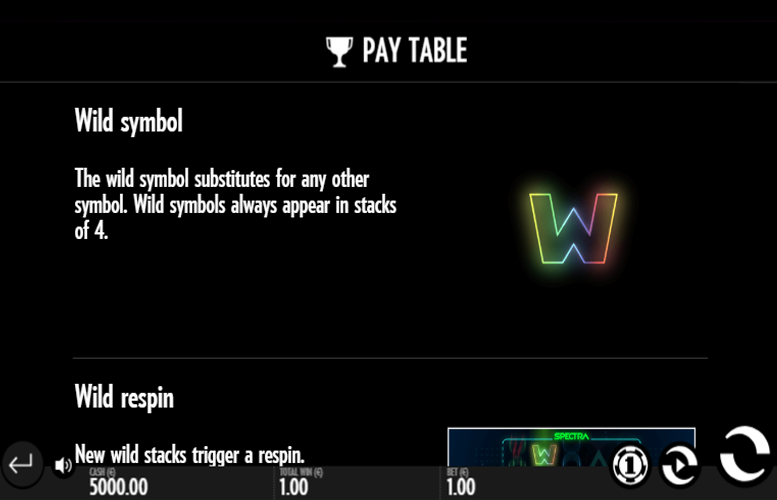 The “wild” symbol in the Spectra slot machine is stacked in fours. It will substitute for any other symbol in the game. Landing new “wild” stacks on the reels with trigger an automatic re-spin. 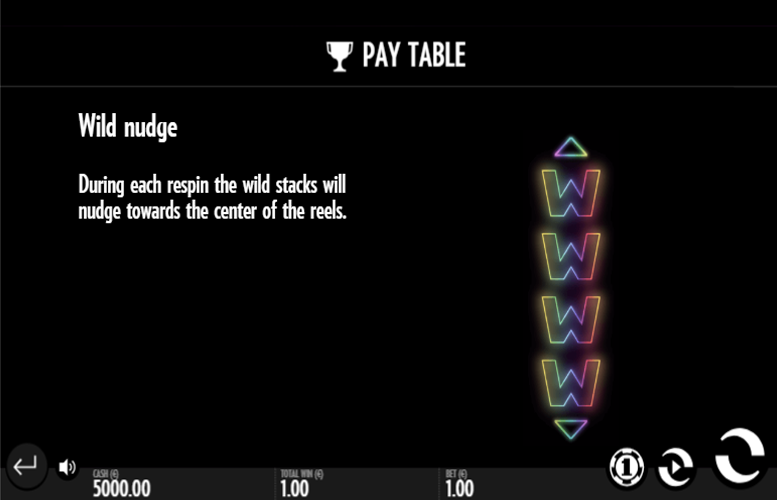 During each re-spin “wild” stacks will nudge towards the centre of the reels. In addition to those symbols paying the largest prizes, there are also those that award lesser prizes. Rather than borrow from the tradition of using the upper end of a standard deck of playing card to represent these lower value symbols, Thunderkick have instead opted to use geometric shapes that have been made to look like extras on the classic video game asteroid. Unfortunately, players are not given much choice as to how to distribute their bets on the Spectra slot machine. Rather than include options to alter the number of win lines played or how much is bet on each one, instead Thunderkick have included just a total bet amounts to select from. There are 12 options to choose a total bet per spin. These range from just 10p up to a reasonable £100. We think you’ll agree that whilst the very highest rollers might find this upper limit a little low, most players will find it more than enough. All things considered, the Spectra slot isn’t that great. We were initially hyped up for it since it marries two of our loves – casino gambling and classic video gaming. However, on closer inspection, it’s kind of lame! Spectra features basically no special game modes. Sure, there are a few interesting “wild” dynamics but ultimately, without a true second screen bonus, players are going to get bored. The slot doesn’t even redeem itself with a monstrous return-to-player rating or outrageously large main game prizes. In truth, we really struggle to see the appeal, beyond its visual attributes, of this title! This game has a rating of 2 / 5 with 217 total reviews by the users.